A mineral that helps you absorb other minerals may sound funny to say out loud, but that is the absolute truth with Boron. A biologically active trace mineral, that affects calcium, magnesium and phosphorus metabolism. 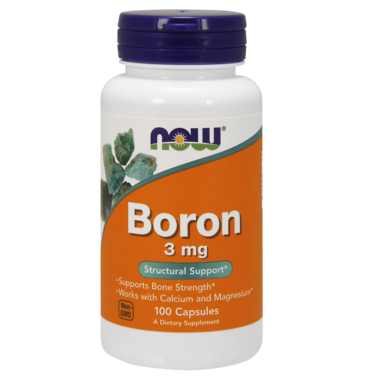 Boron is known to support bone strength and structure. Calcium Borogluconate is bioactive, or “body- ready”, and needs no transformation by the liver to be utilized. This 3mg dosage is our highest potency offering. Higher dosage so you can make the most of every capsule. Adult Dosage: Take one capsule daily. I am very happy with this product! It is needed with certain minerals to hold the calcium in the bones and teeth.Will by again! I bought this mineral because a friend recommended it to help with inflammation. I have an ankle that is chronically swollen making it painful to walk. I can't believe how effective it is! One small capsule a day and I am walking normally. Don't think I'll ever be able to run marathons again but it is nice not to hobble!